Single use pack with cleaning tools and PPE for rapid, safe cleaning of spillages of cytotoxic drugs. GV Cyto Absorbent Granules absorb spillages for easy collection and removal. Active ingredient Triclosan is an organic anti-bacterial agent effective on acidic spills. Surface wipes remove residues. 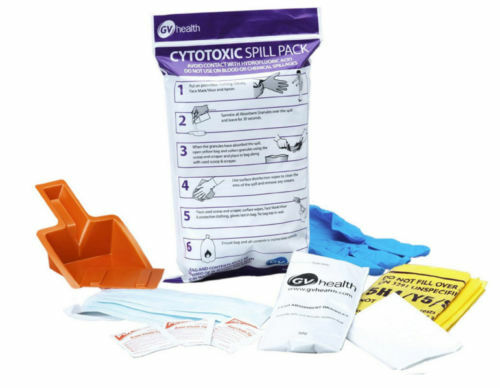 GV Health Spill Packs and Kits hold the NHS Supply Chain contract for cytotoxic spill cleaning. Used throughout the NHS in hospitals, clinics, surgeries, out-patient departments, pharmacies, laboratories; nursing and care homes and other locations where cytotoxic drugs are handled and stored. Safe for use by non-specialist staff. We also supply kits for multiple cytotoxic spillages and for dealing with cytotoxic spillages on soft furnishings. Contact us for more information.